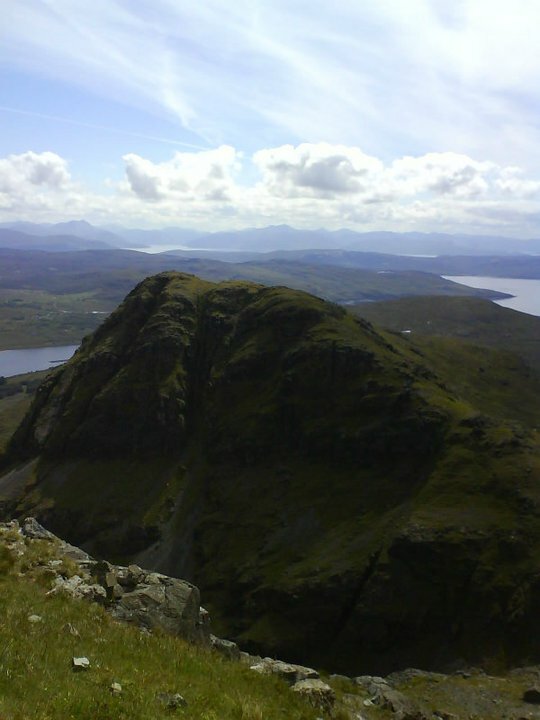 Ralph Wedgwood, philosopher, on the view looking North-West (towards the Scottish mainland) from the Northern summit of Blaven on the Isle of Skye. GB Why did you choose this view? RW To be honest, I was surprised that no one else on the site has chosen a view. The first thing I thought of was a mathematical proof or a piece of music, but because you prefer something visual, I chose this because it’s something I’ve loved for many years, going up to the Scottish Highlands and hiking to see this extraordinary view. GB Does the area have a sentimental attachment for you? RW I’ve been going there since I was a teenager. My first trip was after my A’levels. I don’t know that it’s a sentimental attachment, rather a wish to explore it more. It has this strange, endless richness. I suppose it’s like a project to get the measure of the place. GB You’ve chosen purely natural beauty. Do you feel like it’s a different kind of beauty from a piece of art or even a man-made park? RW Absolutely. Of course gardens and parks are a wonderful form of beauty in which human beings mold nature. But this is the kind of beauty on which human beings have had very little impact. People have introduced grazing sheep, and there were times when the Highlands were more densely populated – up to the 19th century clearances when the crofters were forcibly moved out to North America and the Scottish Lowlands. But this is a beauty that isn’t the product of a human mind. GB Is it an escape from intellectual pursuits for you? RW I don’t know that to be honest. It is an escape from the kind of life I normally lead which is pretty urban. I prefer living in cities. I like the hustle and bustle of human beings getting on with their business all around you. It’s an escape from that and a reminder that human beings are only a small part even of this planet, let alone the universe. GB So it’s sublime in a way? RW Yes it is sublime. I was wondering about the sublime in the Kantian sense. I think this is both beautiful and sublime. The view I chose has sunlight, lush green grass, it has a soft side. Of course some parts of nature are wild with terrifying cliffs and wind and rain and I love that too – but I like green grass and trees. Although trees tend to block the view and the most exciting thing about this particular landscape is how far you can see. This picture was taken in June. I think the most beautiful skies have clouds in them. Every painter who paints skies wants to put a few clouds in. GB And I suppose you must feel some sense of achievement just looking at it, because you’ve had to climb up a mountain to see it. RW Yes, unquestionably there’s an athletic, macho side to all this. There’s a sense that you’ve got to a place that isn’t so easy to get to. Sometimes the weather won’t let you so it’s a rare privilege in a way, to see what you’re seeing. GB So would you say this is a universal beauty? RW I think fascination with mountain landscapes is pretty widespread. You get poetry about mountains in ancient Greek literature, you see them in Chinese paintings, you get Buddhist and Taoist sages going to mountains to meditate. Mountains are perceived as sacred in places like Japan and Nepal. The ancient inhabitants of Mexico built pyramids as artificial mountains. GB 18th century writers like Kant and Rousseau linked appreciation of natural beauty to morality. Do you think there’s a link between this and mountains historically being seen as sacred? RW There are Chinese poets like Du Fu who think of mountains as part of the way in which nature itself embodies a kind of moral system. Although I think you’re making an interesting error, which is to forget that in many religions the gods aren’t particularly moral. I think mountains are just such impressive things to look at that primitive people assumed that gods would preside over such a place. RW I think this view is such an immense vista and yet your mind doesn’t boggle. It can take it in without strain, without chaos, or it being too jumbled up to take in at once. You feel as if you’re taking in something enormous but still harmonious, and you feel somehow elevated. You are literally raised above the landscape but also you feel as though you’re confronting something of extraordinary value. You have a sense that it’s the kind of experience that you want your life to have in it. The arduousness of getting to the point where you see it adds to that sense of its value. GB Would you say this applies to other forms of beauty such as art or mathematical equations? RW Beautiful things reveal their beauty in experience, in a kind of contemplation. The kind of contemplation is one in which many of our mental faculties are engaged at a very high level but without strain. You feel totally absorbed by this thing that demands so much of you – but also seems as if it’s ideally suited to you because it’s not difficult to take in. So it’s complex yet harmonious. It’s immense and yet you can see it as your own.